Reading Susan Cheever’s Drinking in America: Our Secret History reminded me of an exchange between Elaine and Jerry on Seinfeld. Jerry insists that only 4 to 6 percent of the population is attractive. Elaine: So basically what you’re saying is 95 percent of the population is undateable? Likewise, there are crucial moments in American history Cheever attributes to our need for drink. The Mayflower landed in Cape Cod because the ship ran out of beer. The instigators of the Boston Tea Party got carried away after spending too much time at the Green Dragon tavern. Johnny Appleseed was beloved by settlers because the seeds he scattered resulted in sour apples—ideal for making hard cider. A more sober officer would not have sent his beleaguered troops back into battle the way Ulysses S. Grant did at Shiloh. "Grant had courage where none was called for," Cheever writes. "He had confidence in the face of what a sober man might have thought of as a defeat." On the other hand, she points out that Gen. George Custer was not a drinker. It’s certainly a different take than your traditional U.S. history—a perspective, she says, that has been lacking until now. Much like her late father, Cheever is a terrific writer as well as a recovering alcoholic. "I haven’t had a drink in more than 20 years," she maintains. But there’s another pattern here. She points out that "all five of our twentieth-century Nobel laureates were alcoholics—Sinclair Lewis, Eugene O’Neill, William Faulkner, Ernest Hemingway, and John Steinbeck." And, of course, there’s F. Scott Fitzgerald and Edgar Allan Poe. American writers like to drink. A lot. What Cheever finds remarkable is the very nation that once boasted, in 1830, of an alcohol consumption rate of 7.1 gallons per person annually could, in 1920, ban the sale of alcohol almost entirely. "The two strands of American character—the drunk and the puritan, the tavern keeper and the temperance crusader—weave around each other as the centuries come and go." (Incidentally, our current alcohol consumption rate is 2.3 gallons a year.) In explaining how Prohibition came to pass, the author cites four factors: "the institution of the income tax, the power of women’s suffrage, and World War I, along with the anti-German sentiment and general xenophobia brought about by the war." The taxes on income were able to replace the taxes levied on alcohol. Something else to consider is liquid courage. Aside from the lubricated Grant and other Civil War leaders, Cheever reminds us that Paul Revere stopped at Capt. Isaac Hall’s tavern in Medford, where the owner "provided Revere with two draughts—tall glasses—of rum to fortify him for the rest of his night ride." "Nine of the 28 Secret Service men who were in Dallas with [President Kennedy] the day he died had been out in local clubs until the early hours of the morning—in one case until five a.m.," writes Cheever. Short on sleep and fighting hangovers, were these men slow to react? Why did no one push the president to the car floor after hearing the first shot? Chief Justice Earl Warren, heading the commission to investigate the assassination, rebuked the agents: "Don’t you think that if a man went to bed reasonably early, and hadn’t been drinking the night before, he would be a lot more alert than if he stayed up until three, four, or five o’clock in the morning, going to beatnik joints and doing some drinking along the way?" Beatnik joints! While President Lincoln sat in his booth at Ford’s Theatre, his lone bodyguard, John Parker, walked across the street to the Star Saloon to have a drink. His plan was to return to his post at the show’s end. What Cheever leaves out is that earlier that night, the owner of the Star Saloon poured a glass of whiskey and a chaser of water to another customer—John Wilkes Booth. "Booth’s pale, delicate fingers squeezed the glass, raised it to his lips, and he downed the drink the way a more temperate, thirsty man might swallow the glass of water," James L. Swanson writes in Manhunt. "Booth savored the warming spirits. It might be a while before he could enjoy another one." There are times in Drinking in America where the author’s politics intrude on an otherwise interesting account. In the chapter on Sen. Joseph McCarthy, Cheever notes that "the postwar years in the United States were years of grotesque panic about an imaginary enemy with the power to blow up the world—the Soviet Union." Imaginary? It gets worse before it gets better. "Was President George W. Bush our generation’s Joe McCarthy?" Cheever asks. "Of course there are plenty of differences between Bush and McCarthy," she clarifies. "One was a two-term president and the other a flash-in-the-pan firebrand, but both danced with the devil of alcoholism and both contributed largely to our culture of fear." It helps to have a drink to get through this section. 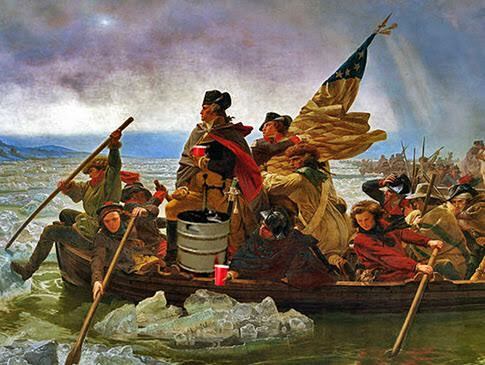 One can also make the case that the role of booze is not unique to the history of the United States. Take Russia, for example. In 1606, the Polish prince Dmitriy, who claimed the czar’s throne after the death of Ivan the Terrible, was eventually declared an imposter. Known as the False Dmitriy, he was executed and, according to historian Nicholas V. Riasanovsky, "the body … was exposed in Red Square and then burned, and the ashes were fired from a cannon in the direction of Poland." I don’t suppose alcohol played a role in that?